Thank you Fender for sponsoring this Gift of Music post. Learn guitar at home with Fender Play! I was recently chatting with one of the moms at P’Diddy’s football game. I knew her son of course who was in P’s class, but today she was telling me a story about her 11 year old daughter. She was a guitarist, singer and songwriter who had her street performance license to perform in cool places. She was just in the LA area and was heard by someone famous who happened to walk by while she was playing. This young girl is probably now going places and you know how it all started? A gift of a guitar when she was young. I went on to share my excitement about guitar playing with her. 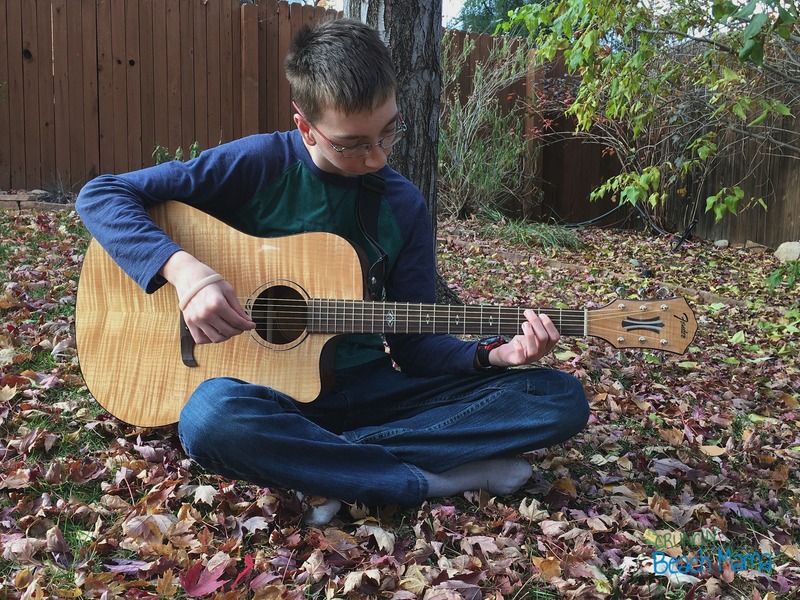 C’Man is 15 and has wanted to play the guitar for a long time, but life just gets in the way and we never signed him up for steady lessons. 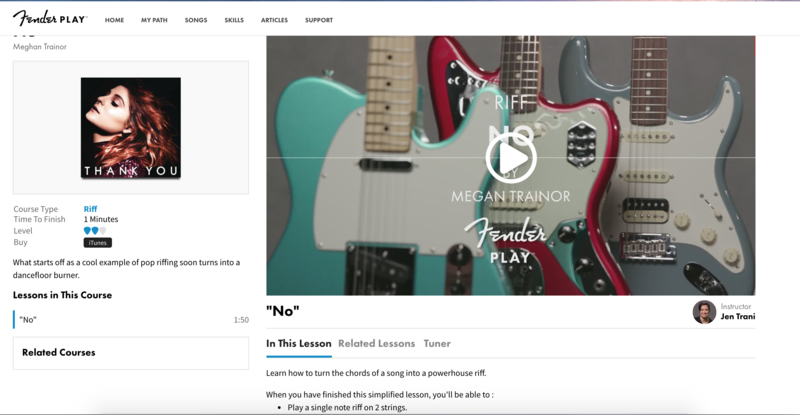 In July, I shared Teaching Teens Online Guitar Lessons with Fender here on the blog. He now learns from home – at his pace! This is perfect for us because between high school work and rocking climbing team he doesn’t have much time to spare. Last night we were at our church service listening to the fantastic band and I whispered in his ear, “just think one day that could be you playing up there.” He grinned. I know he can see it. Choose from well-known songs to learn. C’Man is into country music and so his customized curriculum is built around that. It’s his Path to Play. Though sometimes I’ll sneak in there and browse all the Songs and try to get him to play me a little something that I recognize too. There are hundreds of videos and exercises, all taught by a variety of faces so you don’t get bored. Each video shows you a close up and split screen of both the right hand and the left, whether it’s a new skill, a recognizable riff or a full song. We like how each lesson is kept pretty short. Even a one minute learning video feels like you’ve accomplished something for the day. It’s all about the practice, right? That’s what I keep telling him! Every time I hear him strumming the chords, I smile. Music in the house boosts all our spirits. You can start your FREE 30-Day Trial at play.fender.com – see if you like it! Who in your family wants to learn how to play the guitar? WIN the Gift of Music – 15 Winners! This giveaway is by Fender and Clever Girls who are responsible for prize. US only. I would LOVE to win this and gift it to my husband for Christmas! He sold most of his musical gear 6 years ago when we found out we were expecting our first after he had just been laid off for the winter, we sold his truck to keep our house and then inevitably lost that house as well. My son would love this. It is a great hobby. This is such PERFECT timing as we recently bought a guitar for my 7 y/o granddaughter. YAY! What a great prize! I have a kid who wants to play. This would be a wonderful gift! want to win this one for hubs if they do a left-handed prize option. This is such a great package. Perfect for beginners. Great long lasting company for sure. This would be an amazing gift for my teen son! This would make a great Christmas gift for my son. I'd really love to have an acoustic guitar. I have an electric now and I'm having a lot of trouble trying to figure out how to play. This is so awesome! My hubby would die to have a new guitar. What an amazing giveaway. This is one of 4 things on my 12 year old daughters Christmas lists. My eyes about bugged out of my head when I opened the email and saw it. She is dying to learn to play and is very into music. Looks like the perfect setup for a beginning player. Great gift! My son would love this Fender guitar kit. I haven't played in many years. This looks like a good way to get it back. Good luck everyone. Awesome giveaway , perfect for a beginner. Looks so easy to learn to play. This would be such an awesome gift for my son. Thanks for the chance! Thank you for the chance to win! This would make a great Christmas gift! The Fender Squier is a good beginning guitar. Our little guy has been asking for a guitar. How cool! This would be perfect for my brother-in-law. He's loves guitar. Thanks! My niece is interested in learning the guitar. She currently plays the ukulele and loves it! I would love to win this for my teenage daughter! She plays the ukulele but really was to learn to play guitar next. Thanks for the awesome giveaway! My husband plays guitar and this would be a wonderful Christmas present for him! That's a really nice looking guitar for a beginner's model. wow guitar is such good gift for muscians. My daughter would love to have this...come to think of it so would hubby! They could both learn to play it! This guitar will make my little nephew the next Stevie Ray Vaughn! I would love to win for my son on he loves playing and listening to music. My nephew would really love this for his Christmas gift. Fingers crossed. Thank you. My son plays the guitar. This guitar will be great for him. Both my niece and nephew have been considering taking up guitar lessons. This would be such a great gift for them. This would be great for my kids for Christmas. Oh, this would be so wonderful for my son's first guitar. It would be a brilliant gift underneath the tree just for him. Just in time for me to be able to gift this to my nephew who's been asking for one this year. I would love to win this for my husband. He sold his guitar and equipment a few years ago when we needed money so badly. And he plays so beautifully, I really miss it. My daughter would love to learn how to play the guitar. My grandson would love this. Thanks for the chance to win. My daughter would really enjoy this. The Fender site has lots to offer! This would be so cool - everything you need to learn how to play guitar and from a brand we have all heard about! I would love to teach my son to play guitar! What a cool giveaway! All 3 of my kiddos would love to learn how to play guitar, one plays the drums which I love but I'll take strumming over loud banging until he gets more seasoned on those drums lol! I would love to win this great gift for my boys! My daughter and son go to music school and this would be great for us! Thank you for your kindess in giving charity. This is an amazing gift idea for Christmas. Wow this would be so nice for my little one who wants to learn to play! This would be a great gift to give to my husband. I am excited to win a guitar. This would be amazing to win! It would be an amazing opportunity to learn and play on this guitar. learning an instrument can be such a fun rewarding experience. i have always wanted to learn guitar. This would make such an excellent gift for so many of my friends and family. Oh this would be so wonderful to help teach our little one how to play! He has wanted to learn for a few years now. Fender has been a part of our family for generations. This prize would be great for the littles. I have enjoyed entering your giveaways. My nephew would love this. Great prize - would love to win. This would be a fantastic gift for my son. He has an older electric guitar that was gifted to him but it is kind of a mess. This looks perfect for a beginner. Perfect Christmas present! I like that Fender offers a free trial and app that tracks your progress. This would be a great gift for anyone with an interest in learning to play guitar. Comes complete with everything you need to start. What a great way to learn how to play guitar! My granddaughter wants to play the guitar. This would be an awesome gift for her. Also I love the Fender Play site where one can learn to play the guitar. Our middle son has been asking for a guitar! This looks perfect for him. I would love for one of my grandchildren to learn to play the guitar. What an amazing giveaway! My youngest wants to learn guitar so bad and this would be a huge step towards reaching her goal. Thank you! My youngest of 6 is a senior this year...I will have some time to reach for my own hobbies and fun much more. 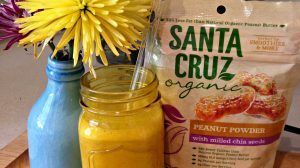 Am so excited about this giveaway! Also cool is the play feature. It's been a LONG time since I was able to try to play. The once guitar I tried was SO big I couldnt get my arm around it. Wow. I never played guitar and always thought it was a cool instrument to play. It has been years since I played an instrument. I played cello and piano in junior high school. I think it is time! I used to play guitar years ago, but haven't had an instrument in a long time. Winning this one would jump start my and get me picking and singing again. I love that this is a bit smaller scale-that would make a big difference for younger players. It's great that it comes with everything you need too! This fun! My son would love to learn how to play! Thank you for the opportunity to win. This would be perfect for my grandson! He loves music! This would be great for my grandson. He is interested in learning to play, and used to strum some with his grandpa (who would hold the chords), who passed 3 years ago. This is very nice, my almost 16 yr old daughter is very musical, she plays flute in the high school band here and also plays Lira (a percussion instrument) in her private school band abroad. I'm sure she would enjoy learning guitar as well. I've played guitar for many years now and my nieces/nephews have started to show interest. They would absolutely love this! This would be the best holiday gift for me, ever. As a child I used to play guitar, then stopped as a teen and would love love love to pick it up again. This guitar would allow me to do so. Therefore I so hope I win! This would make a teenager I know very happy for Christmas. I looks like it would work great for a beginner. I would have loved to have taken guitar lessons at a young age. 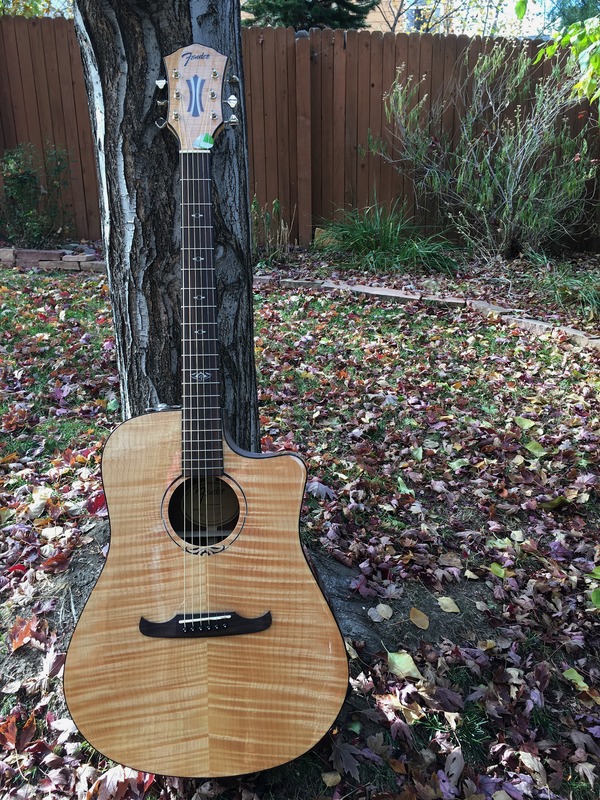 I'm not too sure what to comment on here, but I WILL tell you that a beginner guitar (basic like this one) has been on our wish list for YEARS....it's nice to finally see a giveaway for one and nice to have the chance to enter it too! Merry Christmas and Happy Holidays!! I want to win this for my sweet husband. He wanted a guitar as a boy, but never got one...maybe he can learn to play now. Thanks and God Bless! Wishes happy holidays. This would be a great hobby to learn. 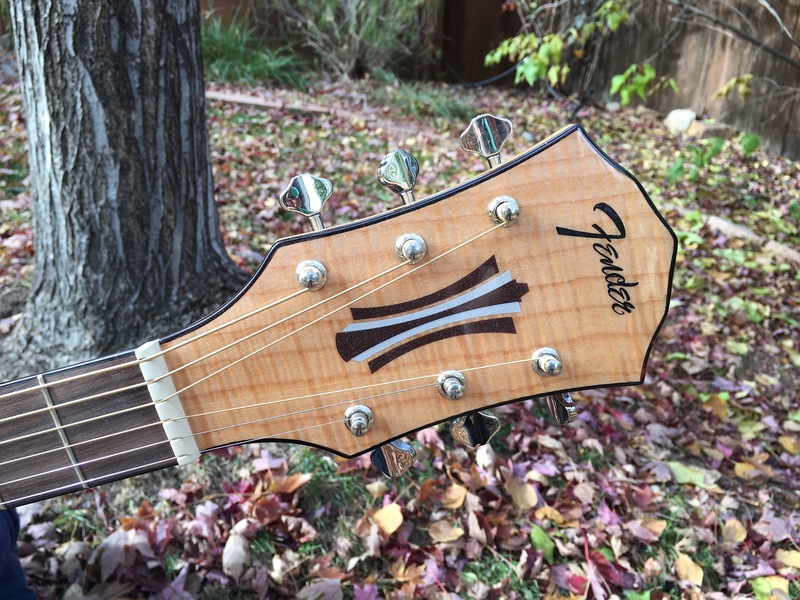 I love Fender guitars, they are very nicely made and fun to play. Been playing for 25+ years now and Fender is definitely one of my favorites! Fantastic prize! I would gift this to my mom. She has always wanted to learn to play. We would love to win this! This is great! I would love to win this! I used to play guitar when I was a teenager and was thinking about starting it up again! My dad bought me a Squier when I was 15, I wish I still had it, so it would be great to have another. Thanks so much! I love playing guitar. These are so nice! This is the only thing my 14 year wants for Christmas. I have no way of getting one right now so I have my fingers and toes crossed for this one. My son would be so excited for this, he wants to learn to play guitar and Fender is his favorite guitar brand. This would be so wonderful for my daughter! She's been hoping to start guitar lessons! My 10 year old daughter would love this for Christmas!! I want to learn to play the geetar. This sounds great. Thanks. I would love to win this for one of my daughters. She has self taught herself some songs using my husband's guitar. My daughter is determined to learn to play. When I was young, I also wanted to take lessons. My brother learned. And my mom told me that guitars were for boys. So I want my daughter to learn and to play the heck out of the guitar. And then maybe I'll learn too! I would love to win this for my husband. He had a guitar and I know he misses it as he loves playing. I really hoping to win this for my son. Thank you so much for the chance! Fender is a really good brand name! This would be great for my mom as she has always wanted to play guitar. My grandchildren would absolutely love to learn to play a cool Fender Guitar for a fun time. Just wondering who the winners were? It wasn’t a giveaway that I created so I didn’t pick winners. I will email them and ask about it since you aren’t the first person to ask me. I’ll let you know what they say!